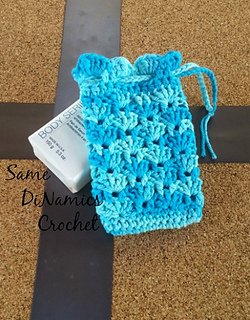 This Ocean Fans Soap Pouch works as a great soap pouch for washing. The 100% cotton yarn used is perfect for using with water. This Ocean Fans Soap Pouch also serves as a soap saver for those little slivers of soaps that are often left over. 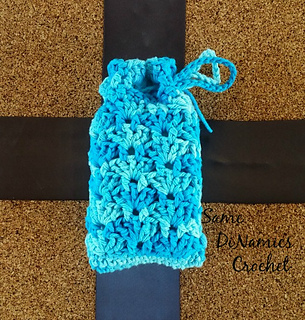 This Ocean Fans Soap Pouch/Saver is part of the Spa Basket Crochet Along! This event will run from 8/30/16 through 12/7/16, and features 12 patterns from 12 amazing designers. The patterns will combine to make a lovely spa basket, perfect for gifting. All the patterns will be made in worsted weight, cotton yarn. Use stitch markers to mark loops to help guide you. Rounds 1 - 3 are worked in continuous rows. Join at the end of row 3. Use stitch markers to mark your rows.